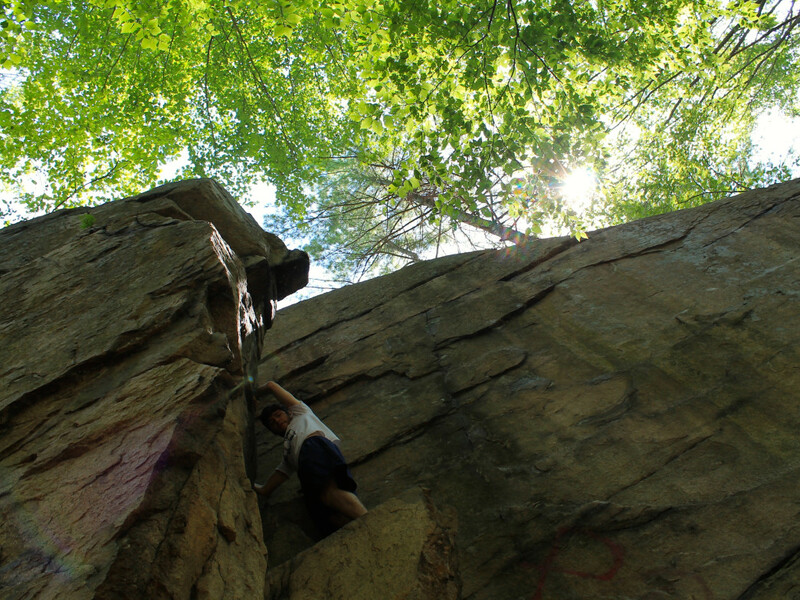 College Rock in Hopkinton, Massachusetts, is about 35 ft. tall and a great place for an easy climb. 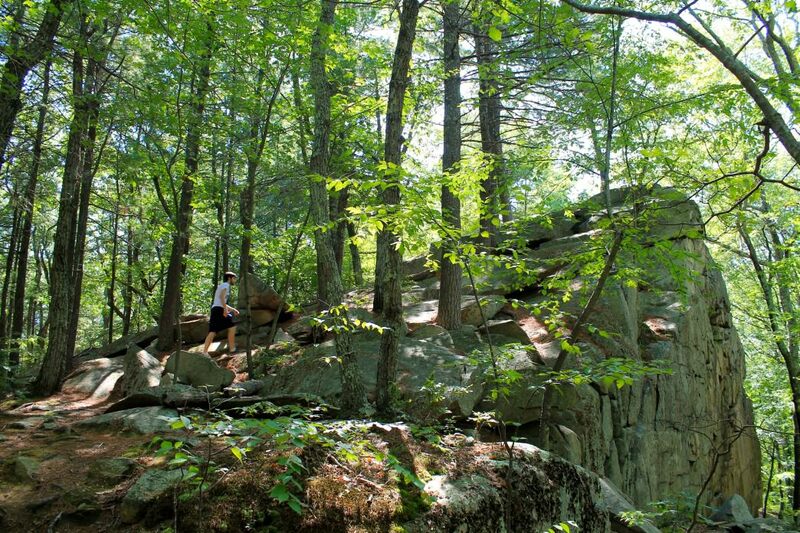 It borders the MBT Trails at Vietnam in Milford, also a great place for mountain biking or an effortless hike. The land beyond the rock is about 11 acres, but the walk from the parking area to the rock is short. The varying structure of the rock gives climbers options to take easy routes or more trying climbs. As much or as little time as you would like. College Rock in Hopkinton is exactly the kind of place you’d want to kick back and have a beer. This modestly sized boulder can be climbed by anyone. You can essentially walk up the backside of the 200 ft. long west-facing crag. It is only 35 ft. at it’s highest. 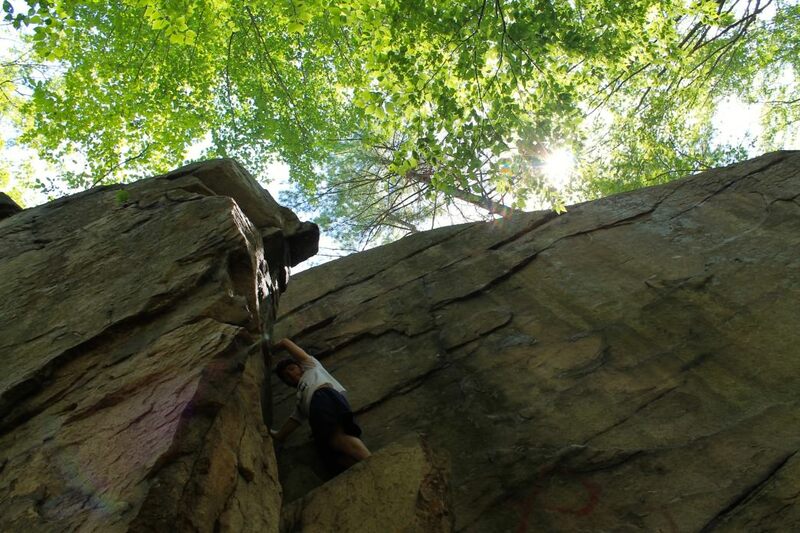 The front side of the boulder offers a steeper route filled with corners and overhangs, and ranges in difficulty. You will have this place to yourself. Our visit was extremely quiet, even in the middle of summer. This is a great place if you’re just trying to get outside and do something without the commitment of dragging all your gear along. Those who are bringing gear should anchor from trees, but be careful because some are more weathered than others. The boulder overlooks some trails and a bit of Milford so you may get a view of some mountain bikers zipping by. College Rock is super shady so expect some dampness a bit longer after rain. You’ll want to visit on drier days to avoid the slickness on the boulders that comes from humidity. Anyone from the beginner to the experienced climber is going to appreciate College Rock because of its varying structure. Our visit didn’t include any gear and an inexperienced climber who was able to safely explore the rock without trouble. College Rock is very accessible. If you’re using the GPS punch in 23 College St. Hopkinton, MA 01748. Take Rte. 495 to exit 20, then Rte. 85 north towards Hopkinton. College Street is about 2.5 miles away from there on your right. The free parking is about .2 miles up the road. Look closely or you’ll miss it— it’s essentially a small opening in the woods with a leveled dirt patch fitting 8 cars at most. Weekends are going to be a bit busier, so due to the confined parking I recommend weekday visits. If the lot is full, there are other small dirt pull-offs along the road. Within the parking lot there’s three clear dirt paths you can take. College Rock is accessible by any of them, but the middle path is most direct. You’ll see it within less than .2 miles of walking. You may also notice during your visit the information area isn’t particularly well kept, and lacking a supply of maps, but you can find trails on MassTrails. For grub, Main Street is loaded with options. It’s about 3 miles, or a 7-minute drive from College Rock.